We have dined here in the past and always found it to be good. However on this occasion we were disappointed. We ordered 3 meals, the steak, chicken filo and also chicken schnitzel. The steak was amazing, cooked well and a very generous meal. Unfortunately that is where the compliments end. The chicken schnitzel was 2 chicken patties like the Tegel takeouts you buy at the supermarket, not the big freshly crumbed schnitzel we expected. The filo was a different flavour to what was advertised and had obviously been microwaved as the pastry was tough and rubbery rather then buttery and crumbly. The atmosphere was good, typical to any pub but unfortunately we will not be eating here again. This tavern has plenty of space, service is great, and a good family atmosphere. What I especially like about this place is that they will mix and match food for you if the menu options are not exactly what you are after. Thank you Gavin - I will pass this onto my staff - We try on most occasions to keep our customers happy. Down for the Alex 7's and this is where everyone gathers. They do have food and drinks are not cheap with a cider being $10 for a small handle. Couple of pool tables with pokies. Excellent bistro menu, but I wanted something a little different, and it was no trouble to have that organised. Huge portions. Chef came out several times to check how our meal was. Thoroughly recommend. 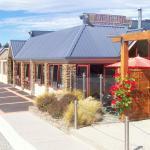 A very good local Tavern with an excellent Restaurant , Plenty of Parking , a comfortable place to stop for a meal . Been to Stadium Tavern? Share your experiences!